Well, my fellow Celtics fans, it’s been a fun ride. This regular season has had me as hyped as I’ve been for the C’s since they took LeBron and the original super team Miami Heat to 7 games in 2012. After a 2016-17 season in which the Celtics finished first in the Eastern Conference and made it to the Conference Finals for the first time since that 2012 series with the Heat, everyone knew the Celtics had more coming. They were in possession of Brooklyn’s lottery pick, which ended up being the No. 1 overall pick in the draft. They were in position to sign a big free agent, and possibly move assets to add another star, and that’s exactly what they did. They signed Gordon Hayward, traded their No. 1 overall draft pick for other picks and moved down 2 spots to take who ended up being the best of the top 3 overall draft picks this season in Jayson Tatum. What else did they do? Oh right, Danny Ainge made a Red Auerbach-like move, and traded an injured Isaiah Thomas who would be in his contract year, along with Jae Crowder, and a less valuable Nets pick for one Uncle Drew, the man who carried the Celtics all season, Mr. Kyrie Irving. After the 2017 offseason, one thing was for sure – the Boston Celtics were NBA royalty again. Which was great for us Celtics fans, but even better for the NBA. However, as we know, things didn’t go according to plan. Gordon Hayward suffered a gruesome leg injury just 5 minutes into the first game of the season, leaving the game in the hands of Kyrie Irving, Al Horford, and a bunch of youngsters. Despite the odds, that squad almost pulled through that night, but unfortunately they fell one Kyrie Irving buzzer beater short of the W against Kyrie’s old friends (or frenemies) in Cleveland. Little did we know at the time, but that game would come to summarize the Celtics whole season. Once Hayward got hurt, more of the load got put on Kyrie, and their younger guys knew that they were going to have to step up if they were going to get the win. They may not have ended up winning that night, but the Celtics sure did step up this season. The team was as deep as ever with a New England Patriot-like “Next Man Up” mentality. If Kyrie had a bad game, it could be backed up by a big performance from Jalen Brown or Terry Rozier. When big men Horford and Marcus Morris were hurt at different points in the season, other guys on the team stepped in and got it done — because as they learned after 5 minutes into their first game, the show must go on. After opening the season 0-2, the Celtics went on a 16 game winning streak that made everyone aware that these Celtics were not going to concede the season after losing one of their best players. Things might have fizzled out after the streak ended, but as I write this, the Celtics have 54 wins and have clinched the No. 2 seed in the East. The show went on. 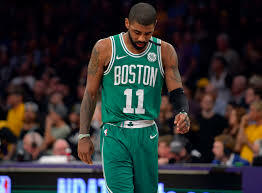 It appears that show has all but ended after hearing the news that Kyrie will miss the rest of the regular season and the playoffs due to a knee injury. Kyrie had a magical first season with the Celtics, averaging 24 points while shooting nearly 50%, along with 5 assists — earning his second straight All-Star start. The stats, while impressive, don’t tell the whole story. Kyrie was keeping the Celtics alive in basically every game with his fancy footwork, razzle-dazzle handles, and oh that sweet clutch shooting. The perfect way to describe Kyrie’s role with the Celtics in one word: “irreplaceable”. Which is not the word I want to use to describe the guy who won’t play another game for my favorite team this season. It’s also not the word I want to use to describe the leader of the team posing the biggest threat to end LeBron James’ Finals streak, and bring a little parity back to the NBA playoffs. With that, the news of Kyrie’s injury is absolutely terrible for Celtics fans like myself, but it’s way worse for the NBA in general. We’ve had 7 straight years where we have had a pretty darn good guess of, at least, who is going to be in the Finals, if not, who is going to win it all. We’ve had 3 straight years of the same 2 teams in the Finals. It’s been 8 years since the NBA’s two crown franchises, the Celtics and the Lakers, have been to the Finals. This is TERRIBLE. This season, the Celtics were finally a legitimate championship contender, and it really looked like they would over take the Cavs in the Eastern Conference, but no — the sports gods couldn’t allow it. They had to have their precious King James make it to his 8th Finals in a row, so they tore apart Kyrie Irving’s knee. Now the Celtics will be fortunate to win in the first round, and just plain lucky to win in the second round of the playoffs, so LeBron and the Cavs will coast their way to the finals for the 4th straight year (8th straight year that a LeBron-lead team will coast to the finals). Now I know what you’re thinking, “Toronto is the best team in the East! They could beat the Cavs in the playoffs!” Just stop. Did you see the beating the Cavs gave Toronto the other night? The Raptors will not beat the Cavs in the playoffs. They’ll be fortunate to win one game against them. Oh but wait. Just because the team from the East is the same in the finals, doesn’t mean the team from the West has to be the same, right? Maybe. Up to this point in their careers, Houston’s Dynamic Duo of James Harden and Chris Paul have been criticized for their lack of performance in the playoffs. So we’ll see if they have what it takes to beat this somewhat banged up Warriors team in the playoffs. But let’s be honest. Even if Houston beats Golden State in the Western Conference Finals, or even if Portland, OKC, or one of the other handful of equally good Western Conference playoff teams upsets one of the top two (Houston and Golden State), that still gives us one half of the same thing we’ve seen the last 3 years in the Finals. That is not parity. That is not exciting. That is terrible. The Celtics were our only hope to see something different in the Finals this year. And now, that hope is lost.